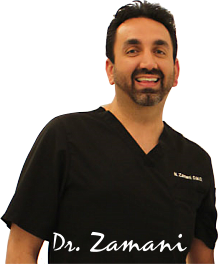 “I would like to share a bit of personal note about my experience with Orthotic and the Neuromuscular treatments with Dr. Zamani. The first time I was 18 years old and went to a Medical Doctor, I had pain on the Right side of my face and he gave me muscle relaxers. I took those and it made it feel better, but I knew I was grinding my teeth. My dad had just died and I was under a lot of stress at that time, and I had a basic guard made by another dentist to protect over my teeth. I wore that all the time to protect my teeth, but still had headaches and other symptoms. But as time went by I started having pain on my head, neck, and right shoulder. I associated the pain on my shoulders to my job and saw a massage therapist to help eliminate the pain. Even after seeing the therapist my pain would come back in just a few days on my shoulder and I would contribute this to my job. I even started having tingliness of my right fingers. I even had consultations with other Medical Doctors to have Carpel Tunnel surgery! I even went as far as having the time set aside to have the procedure done to help eliminate my problems. Insomnia settled in, and I was at a point where I was tired all the time because I could not get enough sleep at night. Now I was at a point where I couldn’t sleep and taking 800mg of Motrin on daily basis. I would do whatever I could to help with the pain and being able to get a good nights sleep. I was tired constantly because I would wake up about five times a night. I even blamed my problems on my husband because he had sleep apnea, and I would think that was his snoring and sleep issues that kept me awake, causing these problems. I was physically exhausted and wanted to cry all the time. I had known about Neuromuscular treatments and therapy because I was in the dental field, but I did not know it would help me with my situation. That’s when I discussed this with Dr Z. He started Neuromuscular treatments with me and we did the TENS and orthotic treatments. I had a removable Orthotic made. I started to wear the Orthotic and amazingly the first day my problems immediately started to settle! I no longer suffer from any of the symptoms that I used to have. I was amazed that a simple appliance took care of all my problems! The best part about it was that I was able to sleep without any pain. I felt refreshed that I could sleep and had much more energy. I no longer had to be dependent on Motrin everyday to get by. 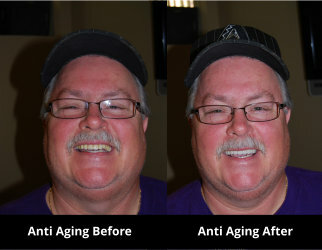 “I want to share how much relief I have felt from headache pain and pain in my jaw and neck since receiving my orthotic. I would lay in bed at night have to tell myself to unclench my jaw before I fell asleep – like that worked. I would try everything. I would try rubbing my jaw, and was constantly moving it around to find a comfortable position; even positioning pillows around my head to try and keep my jaw in a place that wouldn’t hurt. My days would began with headaches from clenching my jaw all through the night. Not to mention the damage this was causing my teeth. Finally I found Dr. Zamani’s office and he talked to me about tensing and treatment with the orthotic. I was skeptical but from the first time it was placed in my mouth, I found relief. From the many visits with his wonderful staff, they will tell you that I no longer know how to close my mouth without it!! I actually miss it when it isn’t in place. I have pain free nights and mornings and the relief from the headaches is worth more than I can tell you. Thank you Dr. Z and everyone in the Gilbert clinic”!